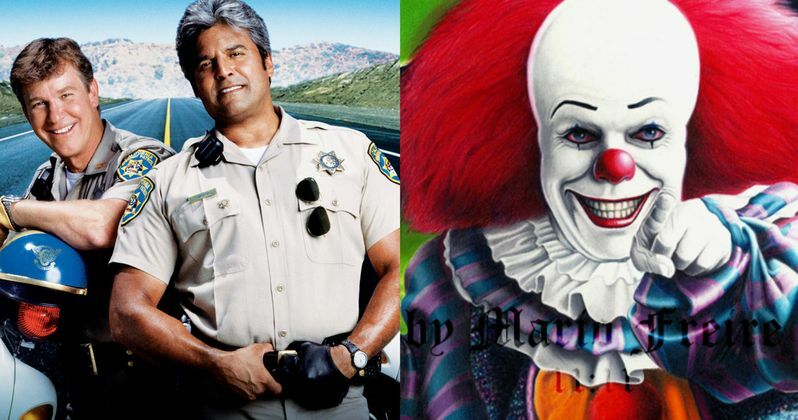 Warner Bros. beefed up its 2017 release slate today, by issuing dates for three upcoming movies, their big screen adaptation of the hit TV series CHiPs (August 11, 2017), an adaptation of Stephen King's IT (September 8, 2017) and an unspecified PG-13 comedy (December 22, 2017). Warner Bros. had already marked August 11, 2017 for an unknown "event film," but today they revealed which title will take that slot. As for the PG-13 comedy, that's anybody's guess at this point. Deadline reports that CHiPs will go up against Sony Pictures' Emoji on August 11, 2017, but it will also open one week after three highly-anticipated summer movies. 20th Century Fox will be unveiling Alien: Covenant on August 4, 2017, while Universal Pictures will release Pitch Perfect 3 and Open Road Films will debut Blazing Samurai on the same date. As of now, no other movies are slated to hit theaters for the rest of that month, but that will surely change soon. Dax Shephard and Michael Pena are set to star as California Highway Patrol officers Jon Baker and Francis "Ponch" Poncherello in CHiPs, roles which were first played by Larry Wilcox and Erik Estrada in the hit TV series of the same name, which ran for six seasons between 1977 and 1983. The supporting cast is rounded out by Vincent D'Onofrio, Kristen Bell, Rosa Salazar, Adam Brody, Jessica McNamee, Vida Guerra, Rene Moran and Kelly Richardson. Dax Shepard is also directing from his own script. Shooting began in November of last year. IT is based on Stephen King's iconic book that follows a group of seven children who were terrorized by the eponymous being that exploits the fears and phobias of its victims in order to disguise itself while hunting its prey. The story is actually being split into two movies, with the first centering on the children, and the second focusing on the same characters as adults, as they reunite to defeat IT once and for all. Will Poulter was originally attached to star as the horrific clown named Pennywise, but it is unclear if he is still attached. The actor himself doesn't know, saying he was originally selected by director Cary Fukunaga before the filmmaker dropped out, and that he fit Fukunaga's vision, which is decidedly different from the incarnation that is going before cameras soon. Andres Muschietti is set to direct, with producer Roy Lee revealing in February that the adaptation will be rated R, with production starting later this year. IT currently has the September 8, 2017 weekend all to itself, with Sony slating an untitled event film for September 15, 2017. It isn't known when Warner Bros. plans to unveil what their untitled PG-13 comedy set for December 22, 2017 is, but whatever that movie is, it will have plenty of competition. The project is currently slated to go up against 20th Century Fox's The Croods 2, The Weinstein Company's The Six Billion Dollar Man, and an untitled Disney fairy tale movie. The unspecified comedy will also open one week after Disney's highly-anticipated Star Wars: Episode VIII.